BERLIN -- Daimler AG's Mercedes-Benz, overtaken by Volkswagen AG's Audi in luxury-car sales this year, is pepping up its lineup of small cars with cameras, radars and Web access to give younger buyers the feel of the S-class flagship. The B class and three other new compacts underpin Mercedes's target of boosting deliveries to more than 1.5 million vehicles by 2015 from 1.3 million this year. The automaker is building an 800 million-euro ($1.1 billion) factory in Hungary and investing 600 million euros to upgrade a plant in Germany to expand production of the models. Daimler CEO Dieter Zetsche needs to widen the appeal of Mercedes smaller cars to regain market share from Audi and industry leader BMW AG. Mercedes is replacing the boxy A class with a sporty hatchback and is considering a small coupe and SUV. "Mercedes's small cars haven't been much of a success up to now," said Stefan Bratzel, director of the Center of Automotive Management at the University of Applied Sciences in Bergisch Gladbach, Germany. "There needs to be an improvement, because compact vehicles are becoming increasingly important for high-end carmakers." The average Mercedes buyer in the U.S. is 54, four years older than BMW and six years older than Audi, according to San Diego-based market research firm Strategic Vision. By attracting younger buyers, carmakers aim to develop brand loyalty early and have customers trade up to their more expensive models later. 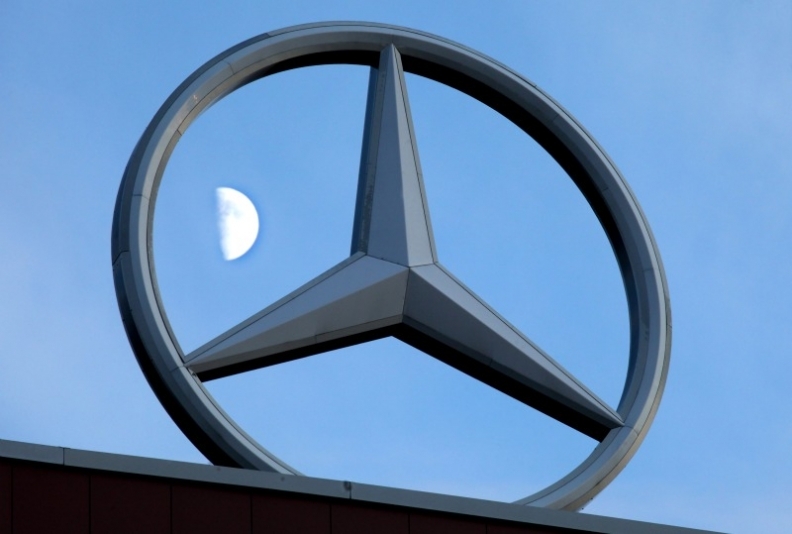 The decline in Mercedes's market share is reflected in Daimler's share price. The stock has gained 29 percent over the past 12 months, lagging the 72 percent jump in Volkswagen's preferred stock and a 69 percent advance for BMW. The redesigned B class will be available with safety and entertainment gadgets, such as a radar-controlled collision prevention system and in-car Internet, when it goes on sale this year, said Hans Engel, the model's chief engineer. It will also use the C class's more robust engine instead of the less powerful four-cylinder motor in the current version. "You will immediately know that these cars are from Mercedes," Engel said during a test ride of a cloaked B-class prototype near Daimler's headquarters in Stuttgart, Germany. "They will have lots of technology that wasn't available in this segment before." Equipping the new models with technology from cars like the $91,000 S class will add prestige to the compacts as well as cut costs for Daimler, Bratzel said. Mercedes had the lowest profit margin of the top three luxury-car makers in the first quarter. Mercedes's earnings before interest and taxes were 9.3 percent of sales, compared to Audi's 10.6 percent and BMW's 11.9 percent. Mercedes's efforts to sell small cars got off to a rough start in 1997 when the A class flipped over during the so-called moose test, a maneuver that assesses a car's stability when avoiding unexpected obstacles such as wandering animals. The failure prompted a design fix and sullied the automaker's reputation. The new B class has passed this test, said spokesman Christoph Horn. "The past history of compact cars hasn't done Mercedes any favors," said Bratzel. "The cars were supposed to be elevated by their association with models like the E class, but instead they dragged down the overall reputation." Competition for high-end small cars is increasing because of environmental pressure and growing demand for vehicles built for crowded cities. Audi introduced the A1 subcompact last year and will start selling the Q3 compact SUV in June. BMW, the luxury-car leader, is developing a line of front-wheel drive models and will introduce an electric-powered city car in 2013. Even super luxury nameplate Aston Martin is getting in on the act with the Cygnet urban cruiser, which rolls out this year. The B class starts at 24,300 euros, compared with 22,200 euros for the BMW 1 series and 20,950 euros for the Audi A3. Mercedes hopes to win over young families to the B class with sportier styling and a more luxurious interior, Anders Sundt Jensen, head of brand communication at Mercedes, said this month. The revamped vehicle is also meant to retain current drivers of the A and B class with its van-like proportions and elevated seating position, Jensen said. The two models, which have appealed mainly to older drivers, accounted for 19 percent of the brand's sales of 1.18 million vehicles last year, down from 23 percent in 2009. Mercedes sold 222,400 of the two in 2010, compared to 196,000 deliveries of BMW's 1 Series and 232,200 for Audi's A1 and A3. The current B class, available in Europe, China and Canada, is not sold in the U.S. The new compact models have been designed with all global markets in mind, said Jensen, who declined to specify which vehicles will be offered to Americans. "They will be pure Mercedes and have their own unique characters," Jensen said. "We're sending the clear message that we want to shake up this segment."